We will now know the "baby CLS" - the small four-door "coupe" built on the MFA platform supporting the Mercedes-Benz A-Class (pictured above) and B-Class - as the CLA. It will debut at April's Beijing Motor Show, and it's just one of the five variants that Mercedes has planned for its MFA underpinnings. When it hits the streets in 2013, advance reports indicate that both front- and all-wheel-drive versions will be available. Power will come from a range of gas and diesel engines with anywhere from 110 to 150 horsepower (there's even a potential AMG model with more than 300 hp on the way), mated to seven-speed dual-clutch and six-speed manual transmissions. Of note, though, over its long gestation, the CLA has been referred to as the CLC, but the CLA and CLC are different cars. The CLC is the Concept Style Coupe, said to be based on the A-Class concept, which was a two-door hatchback, yet also said to be an evolution of the F800 concept, which was a sedan. The CLA will make its debut in China, but the CLC will be unveiled in Los Angeles at an Mercedes-sponsored art festival called "Transmission LA: AV Club." 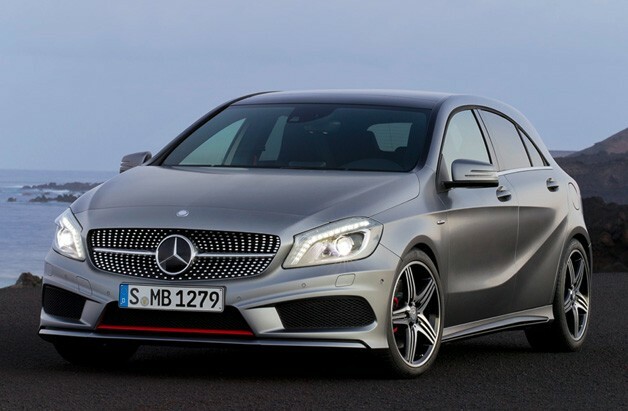 The Beijing show and the art festival overlap, so we'll find out which car is which and what they both look like soon enough.Mercedes-Benz CLA is official name of small four-door coupe debuting in Beijing originally appeared on Autoblog on Fri, 30 Mar 2012 11:00:00 EST. Please see our terms for use of feeds.